With all of the pre-holiday bustle, it's been much easier to cook the recipes first, then edit the text and photos as time allows. Yeah, I know that means the posts are delayed and then back-dated, but it's better than nothing, right?! Directions: Beat together eggs, buttermilk, and 1/2 Tbsp. chives in a small bowl, and then set aside. In a medium-sized, nonstick sauté/omelette pan, sauté beet greens on medium heat until tender and water has been completely reduced, about 5 minutes. (No one likes wet omelettes!) Be careful not to brown or burn the beet greens, especially the leaves, which will cook faster due to their thinness and larger surface area. Immediately remove from heat and transfer to a bowl. Let cool for several minutes. When ready, transfer veggies to egg mixture and thoroughly combine. Set aside. Melt butter in the same pan on high heat. Then reduce heat to low and pour in vegetable-egg mixture. As soon as the omelette starts to set, sprinkle feta cheese on top and season with pepper, to taste. After a few seconds, lift up omelette on one side to check if it's ready to be folded over. 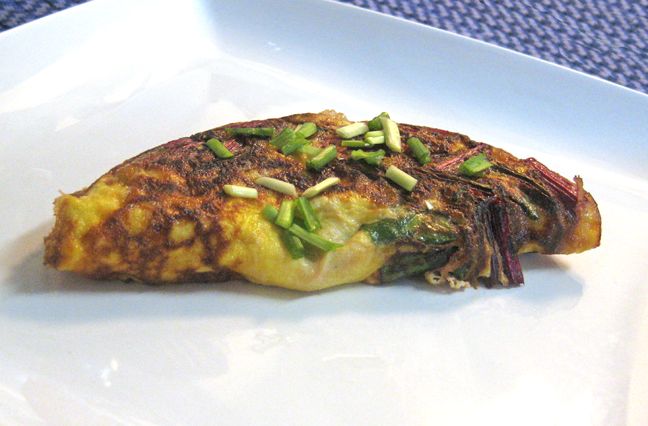 When ready, fold omelette over and continue to cook until desired color (i.e., light golden brown, etc.) has been reached. Then flip over and cook a few seconds more on the other side. (Cooking time may vary depending on how you like your omelettes.) Transfer to plate(s), sprinkle with remaining 1/2 Tbsp. chives, and serve hot or warm. Chef's Notes: Make sure you do not fold the omelette prematurely, as this will make it harder to flip the omelette later, and thus, also harder to cook it evenly. Also, depending upon your stovetop range, you might need to alter the cooking temperature in order to get the best result(s). I have a gas range and cook with Caphalon cookware, both of which conduct heat very well, so the food tends to cook very quickly. Hence, this is why I cook my eggs over low heat. However, this may or may not work for you. Adjust accordingly.